Today I’m going to talk about two words that are similar in meaning but not quite the same. They are “cheap” and “inexpensive”. Let’s say, you want to buy something. If you have to pay a lot of money to buy that product, you can say it’s “expensive”. Contrarily, if you can get the product by paying just a small amount of money, then it’s NOT expensive or “inexpensive”. Now, you can also use the word “cheap” to describe something that doesn’t cost much money. But you want to be careful because, generally speaking, cheap things are cheaply made. 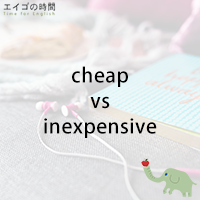 In other words, “cheap” can also mean “of poor quality” whereas the word “inexpensive” simply means not high in price. Now, let me give you a quiz here. Please listen carefully and choose the one that is NOT true. Ready? 1. Cheap things are inexpensive. 2. Inexpensive doesn’t always mean cheap. 3. Cheap and inexpensive are equal in meaning.